"A fresh and clean white with honeysuckle, slate, dried apple and lemon. Medium body. Bright fruit. Drink now." "Prà, like Pieropan, is a benchmark producer of Soave Classico. The Prà name on a label is as good a guarantee of quality as you can get. Their flagship Soave Classico bottling is from the well-regarded and well-situated Monte Grande vineyard. Prà performs an unusual, but highly successful, technique to increase the concentration of their Monte Grande. About five weeks prior to harvest, they sever the canes, but leave them among the vines, allowing the grapes to dry partially on the vine. Then they harvest these partially dried grapes with a small percentage (sometimes none) of normally ripened grapes to make the wine. "Complex and alluring, this offers aromas of dried apricot, exotic fruit, pressed yellow flower and crushed rock. Mirroring the nose, the elegant, structured palate doles out mature yellow peach, tangerine zest and a note of toasted almond alongside bright acidity. An energizing mineral note accents the finish. Drink through 2026." "The Prà winery, although only started in the early 1980’s, has become not only one of the top producers in the Soave appellation, but one of the most important and visionary white wine makers in all of Italy (now red wine as well). The winery is run by Graziano Prà, whose family owned their vineyards for generations, but never commercialized the wines in bottles. The vineyards are situated in the heart of the appellation, in Monteforte D’Alpone. Besides Soave, the winery also produces Valpolicella and Amarone from a vineyard that he purchased and planted in 2001, and whose truly remarkable results are only now being discovered. The Prà holdings consist of 30 HA in Soave and 7 HA in Valpolicella. Graziano was always a big believer in natural viticulture and its positive effect on the wines and has farmed organically since the outset. Nonetheless he is now getting his “official” certification in Soave (in transition as of 2018), though the Valpolicella estate is fully certified. All grapes are harvested by hand both in Soave and Valpolicella as well. The terroir in Monteforte d’Alpone in Soave features classic, very black, volcanic soils which help to impart an underlying power and minerality to the wines. And as Ian D’Agata of Vinous points out, “Prà is especially adept at ensuring the wines also showcase a remarkable degree of finesse.” Much of the plantings were done in the late 70’s, so the average vine age is quite high, especially for the region. Additionally, Graziano was one of the first to see the higher potential of certain sub-parcels in the appellation – for both complexity and ageability – and began producing vineyard-designated wines in Soave early on before it became popular in the region among the better producers. 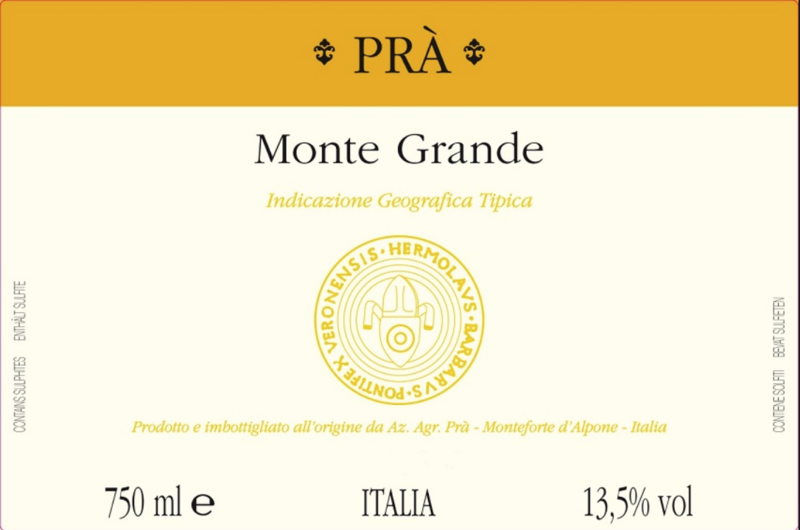 His single-parcel, Monte Grande, in fact was first produced in 1988, and he has since added two other special “Garganega Selection” Soaves, Staforte and Colle Sant’Antonio, each with its own unique formula both in the vineyards and the cellar. 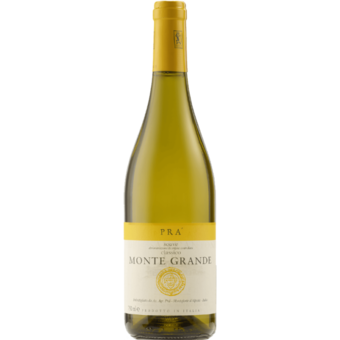 For the Monte Grande, all the grapes come from a single parcel with 70% Garganega and 30% of Trebbiano di Soave (actually a cousin of Verdicchio). The Trebbiano is picked relatively early for freshness, but for the Garganega, after the first waning moon in September, the shoots leading to the grape clusters are cut and the clusters are left to slightly raisinate for another month or so, concentrating both the juice and the acidity. The wine is then fermented and aged in large neutral botti of 15-30 HL for 10 months, and then held in bottle for a while before release. Given the pedigree and underlying material of these Soaves, these wines can age and improve for an extended period of time. Monte Grande can age for 10-20+ years, depending on the vintage. Quite a rarity given that most of the wine in the appellation should be drunk within its first year of life (not to mention that there is still a lot of White Burgundy that starts to poop out after 4-5 years)!